Few issues ignite such impassioned debate as the Second Amendment to the U.S. Constitution. Does it really give citizens the right to possess firearms, or is that right restricted to a well-regulated militia such as the National Guard? Halbrook traces the origins of the Second Amendment back to ancient Greece and Rome, and then through the freemen movement in 18th century England and France. He demonstrates that the framers of the U.S. Constitution were conscious of such history when they drafted the Second Amendment, and that the Second Amendment was clearly intended to allow possession of firearms not just for the defense of personal life and property, but also to prevent government infringement of human liberties. Halbrook has successfully argued against gun restrictions in cases before the U.S. Supreme Court, such as portions of the Brady Bill that required local police to enforce certain federal gun laws. He brings the same meticulous, thorough scholarship to this book. He demonstrates that the right to bear arms is as fundamental a right under the U.S. Constitution as freedom of speech and freedom of religion. Legal scholarship has come to favor the individual right interpretation of the Second Amendment. The question is not whether this trend will affect the courts, but when. 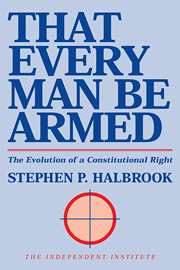 Whatever the future holds, there is no turning back to the days when a judge could say with a straight face that the Second Amendment protects only National Guardsmen, and then only when on duty, writes Stephen P. Halbrook in the Preface to the new edition of his classic work, That Every Man Be Armed. First published in 1984, That Every Man Be Armed was favorably cited in Supreme Court Justice Clarence Thomass concurring decision in the landmark case Printz v. United States (1997)argued by Halbrookwhich struck down parts of the Brady Act. The Fourteenth Amendment was intended partly to protect former slaves from the Southern states abridgement of the right to keep and bear arms. This was one reason that this amendment was hotly debated. There was no debate that the Second Amendment protected an individual right because that interpretation was accepted by all. The Second Amendment was both a reaction to, and an intended safeguard against, tyranny. So cherished was the right to keep in keep and bear arms that when Britain imposed gun restrictions on the American colonies, the colonists considered it the violation of a fundamental right. The Second Amendment was also meant to prevent the new American government from becoming a tyranny. The notion of an individual right to keep and bear arms is found throughout Western thought. The philosophical origins of the Second Amendment are found in the English common law, the Declaration of the Rights of 1689, and a long line of thinkers dating back to the Greek and Roman classics. From Plato to Locke, western thinkers have recognized that an armed populace is a safeguard against the imposition of tyranny. Too often, public debate on gun control and related issues seems to takes place in a historical vacuum. Yet, as Second Amendment scholar and attorney Stephen P. Halbrook shows, Americans right to keep and bear armsinstitutionalized by the Second Amendment of the U.S. Constitutiongrew out of a rich political and philosophical tradition that dates back to the origins of Western Civilization. In the 4th century B.C., for example, Greek philosophers Plato and Aristotle, despite their profound differences, shared the belief that an armed populace was essential for preventing the imposition of tyranny. A few centuries later, Roman lawyer Cicero warned that replacing the private ownership of weapons with standing armies was contributing to the fall of the Roman Empire. In Renaissance Italy, Niccolo Machiavelli (14691527) argued that an armed public promotes civic virtue, which in turn promotes responsible arms use. In 16th century France, political philosopher Jean Bodin (15301596) argued that disarming the citizenry helped create an absolute monarchy. Across the English Channel, philosophers Thomas Hobbes (15881679) and John Locke (16321704) also shared the view that an armed populace deters tyranny. Similar views were reflected in the English legal tradition, the precursor to the American legal system. As far back as the rule of Alfred (871899), the English common law presumed that an armed populace was desirable for ensuring security. So entrenched was this belief that the bearing of arms was made a citizens legal duty. However, as Englishmen sought greater political freedom, the monarchy came to feel threatened by an armed populace and sought to curtail private ownership of weapons. Both the Magna Carta (1215) and the English Declaration of Rights (1688) grew out of the struggle of armed Englishmen. Influenced by these traditions, the American colonists insisted that Britain recognize their common-law right of individuals to own and use arms in self-defense against tyranny. British gun restrictions in coloniesaimed first at Native Americans and later extended to the white colonists during Bacons Rebellion in 1676were therefore bound to provoke conflict. After the American Revolution, the Federalists promised that the new government would have no power to disarm the populace. The Anti-Federalists, who were especially leery of a strong central government, feared that a standing army and select militia would come to overpower the people. These concerns led to the ratification of the federal Bill of Rights in 1791. From the ratification of the Constitution to the Civil War, the act of keeping and bearing arms, including firearms, was treated as a virtually unquestioned right of each individual citizenfor self-defense as well as for subsistence hunting. That the Second Amendment recognized an individual right to keep and bear arms was not an issue for partisan politics, and the courts consistently so held. The only exception to this rule, of course, appeared in the context of slavery. To disarm slaves as well as black freemen, certain courts originated the view that the Second Amendment applied only to citizens rather than to all of the people, and that the Second Amendment did not apply to the states. These decisions were aberrations intended to prevent black liberation. Most commentaries and courts that analyzed the Second Amendment treated all individuals as possessing the right to bear arms; they also construed it as a restraint on state and federal power. After the Civil War, judicial commentators continued to interpret the Second Amendment as protection of an individual right from both state and federal infringement. The right to keep and bear arms, and other freedoms in the Bill of Rights, were viewed as common-law rights explicitly protected by the Constitution. Debates about the adoption of the Fourteenth Amendment and the Civil Rights Act of 1866 play an important role in clarifying how the right to bear arms was perceived following the Civil War. The importance of this debate is heightened by the fact that Southern blacks found their right to bear arms violated and sought federal protection under the auspices of the Fourteenth Amendment. Prior to the adoption of the Fourteenth Amendment, the bearing of arms, and other civil rights, were deemed as protected by the Constitution. But after the adoption of the Fourteenth Amendment, and with the end of Reconstruction, the Supreme Court took a restrictive view of the extent to which the federal government could protect civil rights. Still, the Court continued to treat the right to have arms as a fundamental right and vindicated the right to use deadly force in self-defense. Then, in United States v. Miller (1939) the Court held that the Second Amendment protected the right to keep and bear militia-type arms and relied on case law holding that all citizens were members of the militia. More recently, the Court has also alluded to the right to have arms as a specific guarantee provided in the Constitution. Immediately following Reconstruction, the Second Amendment was viewed only as a restriction on Congress and not the creation of a right. The right to bear arms was not incorporated through the Fourteenth Amendment and states had to make laws regarding it. Furthermore, the Court clarified the regulation of weapons regarded as modified and those which were not ordinarily used for militia purposes. As the Court began to incorporate more of the Bill of Rights in the twentieth century, the possibility of incorporating the Second Amendment was revived. Although the right to bear arms has yet to be incorporated, Halbrook discusses several cases which favor the possibility that it one day might be. One of the ways he shows this is through penumbras, by which the Court uses shadows cast by amendments constituting the Bill of Rights to extend certain rights to the states. Without the incorporation of the Second Amendment, state court decisions regarding the right to bear arms remain crucial. Halbrook offers a brief survey of some of the most important state decisions since Reconstruction, attempting to find some consensus on the issue. Particularly interesting are the state judicial decisions regarding the right to carry a concealed weapon and regarding the definition of what an arm is. Lastly, Halbrook explains the continued swing since Reconstruction of state judicial decisions toward, and away from, the right to bear arms. "Gun ownership is an inexorable birthright of American tradition. 'Americans who participated in the Revolution of 1776 and adopted the Bill of Rights held the individual right to have and use arms against tyranny to be fundamental.' Stephen P. Halbrook, That Every Man Be Armed: The Evolution of a Constitutional Right 55 (1984)." Stephen P. Halbrook is a Research Fellow at The Independent Institute. He received his J.D. from Georgetown University Law Center and his Ph.D. in Social Philosophy from Florida State University. He has taught philosophy and law at Tuskegee Institute, Georgetown University, Howard University, and George Mason University. He has won three cases he argued before the U.S. Supreme Court, including one (Printz v. United States) that overturned portions of the Brady Bill requiring local police to enforce federal gun control regulations.